Printed text plus fully searchable electronic access. 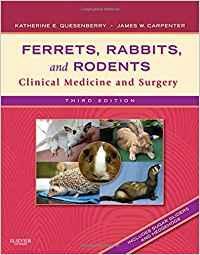 "The addition of full colour dramatically enhances the feel of the bookand the whole experience of it...This book will appeal to first-opinion and referral exotic veterinary surgeons alike...In summary, this is a well-laid-out and easy-to-read manner, while...The text, even though of great depth, reads as though it is written by those who have genuinely had to examine a gerbil on a Friday night, and is all the better of it." "This is a nupdated and expandedhird edition of the well know 'pink book' many practitioners reach for when presented with a small mammal...The content is well written, referenced, and presented in an easily accessible manner with a practical focus.The layout is clean and there are many colour and black and white photographs complemented by line drawings and illustrations, charts and radiographs, which are of consistently high quality...I believe the edition succeeded in their mission to provide 'up-to-date in formation reader-friendly, comprehensive yet concise format'...Ths long awaited refresh will likely restore the 'pink book' being an essential and regularly consulted text for veterinarians dealing with small mammals in practice."